The pattern is named after our dear friend Anne-Marie. She is a super creative sewist (check out her blog I Mani D'Oro to see her lovely creations!) and also an avid cyclist who is stylish, even with a helmet on. We met at PR Weekend in Montreal back in 2010 and kept in touch since then. We loved her idea of a cycling dress, but thought is was targeting a very niche market. After attending a tennis lesson with my first prototype, I made everyone jealous with my super-duper back pocket. I was official: this little pattern was going to be wayyyy more than just a cycling dress! Dress (tennis dress, cycling dress, summer dress, swim dress... you decide!) - I wear mine over my 3462 shorts when I go for bike rides and over my 3247 shorts when I play tennis. I am SUPER excited by this! Last year I needed cycling dresses and really scrambled. These will be great for running too. Oohh me too, me too! You guys are hitting it out of the park with the new patterns! I can see using this pattern in all it's variations. Definitely another winner - LOVE it! I can't wait for your new patterns to be released! This one looks great. I am loving these new patterns. Can't wait for their release. Perfect name for a perfect pattern. ;-) I cannot wait to sew tones of dresses and tops. Ho many cycling friends will ask for one !! when wil your new patterns be released....?? Je te l'offre dès que le patron sort ! I'm really excited to try and make myself a cycling dress but I have never done any active-wear before - what kind of fabric do I get? I have no idea! I'd like something that will breathe well and dry quickly. Any tips? You own (or are eying) the Vanessa Fluid Pants pattern and think "pants can wait, it will be summer soon (at least in Canada)"? We've got news for you! 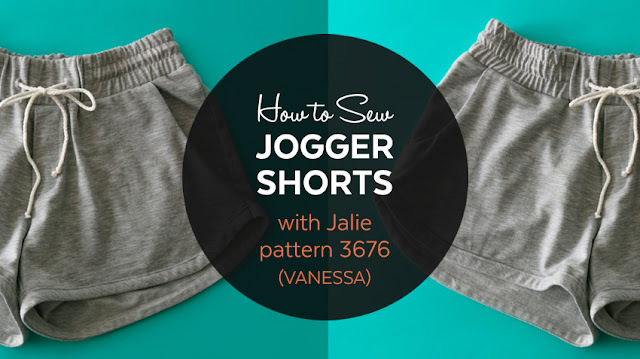 After reading this hack you will be able to wear this pattern year round as you will have anything you need to make great pants AND stylish, comfortable shorts! First off, sizing. I go back to the Jalie Measurement Charteach time I make a garment, even if I made something the week before. Our measurements change all the time and my kids sizes change even more quickly. Juju's measurements (as of today) are 28" waist, 37 1/2'' hips. Her waist corresponds to size S and hips are between sizes S and T. The hips measurements is the most important when picking a size for pants. You will find many t-shirt options in our catalog. You have never sewn one and wonder which one would be the best option for you? This post will help you pick the right pattern and also compare our top 5 t-shirt patterns, showing the tops in the same fabric and size so you can compare apples with apples. WHAT DO YOU LOOK FOR IN A GREAT T-SHIRT PATTERN? Many garments are designed with an encased elastic because the technique is quick and easy. Also, it hides the plain elastic. Did you know that you can totally change the look of the garment by applying an exposed elastic instead? Here is how to do it! The trend is getting more and more popular and goes far beyond the men's underwear world! You can use a wide exposed elastic on pretty much anything: shorts, top, leggings... Have fun! INSPIRATION / COMPATIBLE PATTERNS The exposed elastic is flatter than the casing on fleece sweatpants. 3355 would be the perfect pattern for that and can be used for boys, girls, men and women because of it's straight shape.